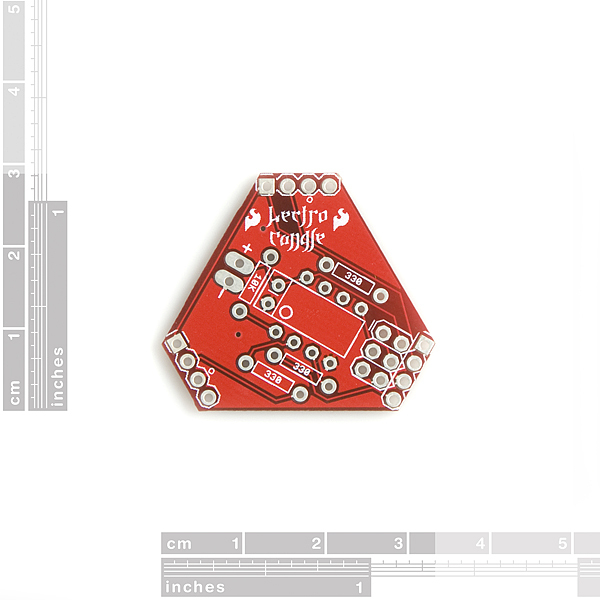 The SparkFun LectroCandle is a simple, through-hole kit, comprised mainly of 3 RGB LEDs and an ATtiny85 to control them. Essentially, the Lectro Candle is exactly what it sounds like – an LED-based “candle” that cycles through all the colors of the rainbow. 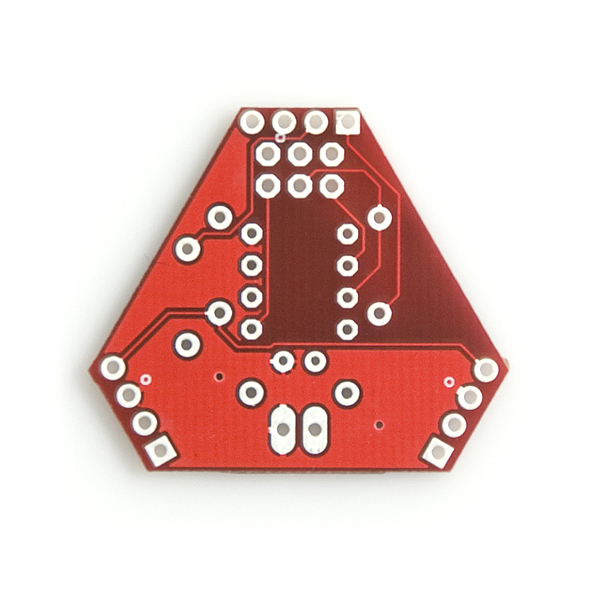 The programming pins of the ATtiny85 are also brought out on the PCB, so you can customize the firmware however you want. 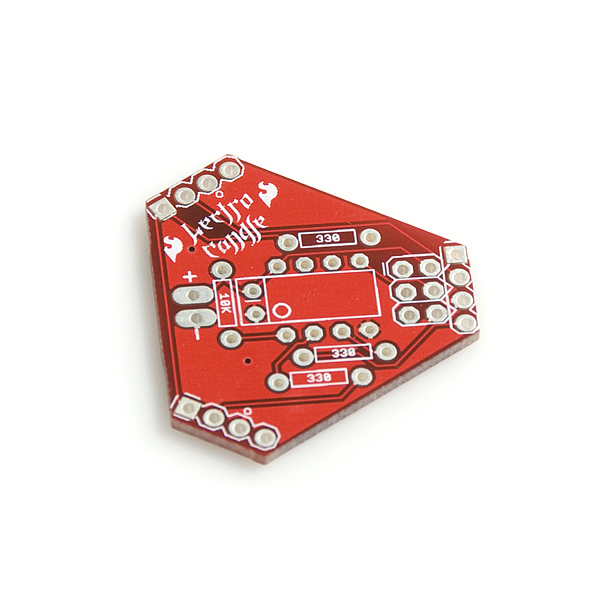 This is a perfect kit to start exploring physical computing and play around with LEDs! Is that the correct source code? For one there are 3 other .c files for er... cat feeders it seems. Also, it looks like the LEDs only cycle each LED colour on and off with a 400ms delay. Seems a waste not to cycle through, well, more colours. i am new to this kind of thing so how would i go about connecting the lectro-candle to my computer so that i can modify the code? You will need some headers to solder onto the board's 6 ISP pads (it's the group of 3x2 pins together), and then you'll need an AVR programmer. See Pocket AVR Programmer for more information (be sure to read the comments as well). Got this to replace a damaged circuit in a christmas tree angel. The flicker rate on this is way too high, and there's no color fading. Not very candle-like, really. It does appear that it's reprogrammable. I'm going to attempt to reprogram it using an Ard Nano as an in-system programmer and see if the result is any more useful, I hope that it is, otherwise I'll be feeling pretty gypped. First for the complaint, I have to say that the plain candle was not so exciting. Second for a Great! I took the plain LEDs and replaced them, with 0805 SMT LEDs in red, amber and yellow (630, 610 and 590 nm wavelengths, 10 - 20 ma rating) soldered on 32 gauge wire about 2 feet long. Caution, green LEDs can be a problem for 3 volts, blue is out of the question. I only go up to yellow green (574nm) but red yellow amber works out better visually too. Now I have a cloud of lights (well, 9 anyway), each light the size of a grain of rice! My wife loves it. I had to make another for her. Soldering SMT on magnet wire can be tricky. Tin the wire first. I use clear nail polish on the LEDs to make sure it does not short out in case it some in contact with metal. Batteries (fresh AAs) last over a week. In this case the random light changes makes for a better effect. It's a pity that - based on the comments - this kit needs more polish. An electric candle which is RGB, random colors, and no button to toggle modes? 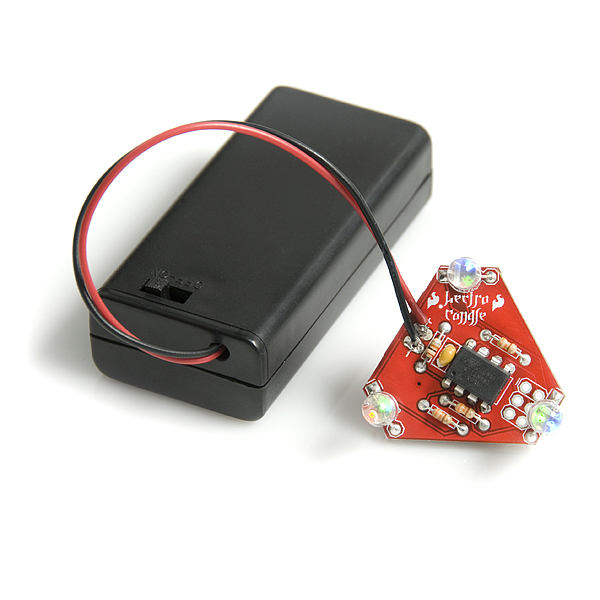 You can already get candle flasher LEDs which proudly flaunt unnatural candle flicker and color. A candle kit is an IDEAL ATtiny tutorial platform, but it looks like the only concept this can offer is soldering. Just built one and noticed the lights were dim and blue not even illuminating. Measured my batteries and they were only putting out about 2.2V. Hooked up a 3 volt power supply and now it works great with all 3 colors and nice brightness. Definitely get fresh batteries. I see you've two spare pins on the micro - 5 and 6. If the blue LED channel was driven from pin 6 instead of 7, you'd have 5 and 7 free, which would enable I2C communication with the board (and these pins are ever so conveniently broken out for you already, right in the middle of the ISP header). A little custom code and you'd have a nice little I2C controllable blinky. I built two of these and reprogrammed them with Paulb's code edited for the Atiny85. I do not have the green led's working at all on either kit. Have not finished troubleshooting so don't know if I screwed something up or if there is something else going on. The default software really is useless... The only code changes I needed were the pin assignments (The green LED's did not work before I reprogrammed...) and the interrupt enable is "TIMSK =" not "TIMSK0 ="
When I first read the name of the kit, I was thinking COOL a 3 LED artificial candle kit! Then I read RGB and I thought cool a kit that fades though the rainbow of colors. But when I tested the code, it seams to just strobe all leds at an epileptic rate... ??? I hear ya, it just scrolls through the colors boringly.